The Club is proud to announce that it will be sponsored by Errigal Contracts for the incoming year and beyond. The club would like to take this opportunity to thank Damien, Martin, Peter and all at Errigal for making this possible. If all at the club and in the wider GAA Circle can try and support them where possible it would be much appreciated. The St.Joseph’s annual Golf Classic takes place on Saturday 28 April 2018 in West Middlesex Golf Club. Tee Off starts from 11am and the entry fee is £50 per golfer which includes a meal afterwards. There may be a special guest in attendance later that evening with details TBC. For further details please contact: Conor Hallissey 0744733384. For senior members this will entitle you to a free club training top, physio at games and covers any insurances for the club. 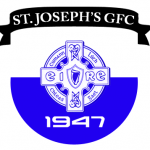 St. Joseph’s youth membership and fees will be announced after it holds its AGM, details which are highlighted below. This can be paid through the usual sources via bank transfer or cash to one of the committee members. This is the lifeblood of the club so many thanks in advance to our continued support from our members. New players are always very welcome to join our friendly club. We are based in West London; the club covers a wide area and current players live in many different areas across London, including, Brentford, Ealing, Clapham, Fulham, Greenford, Northfields, Ruislip and Wimbledon. Transport to and from training and pick-up from stations can be arranged, if required. If you would like to join our club, please do not hesitate to contact us on 07956 666 979. We would be delighted to hear from you. The senior team has been carrying out 5 a side soccer prior to the pre-season getting under way, if you are interested in getting involved please give the above number a call. Pre-season got underway last Sunday with a great turnout. It was great to see so many new faces and bodes well for the season ahead. This weekend the senior team are off Tyneside to play Cu Chulainns Newcastle in a challenge game, one the guys have been looking forward to. It promises to be a great weekend and we will report back the match report next week. You will find a wide range of high-quality merchandise for the whole family! Our new jerseys and training tops will be added in the next few weeks so keep an eye out for them there. Remember to follow us on Facebook and Twitter where you can find daily updates, pictures, match reports and all activities going on at the club.